Okay, now it's time for an example. Here's how you put all the pieces from my "3-List" method together. FREE THE FLAME GOD is a free adventure for DINO-PIRATES OF NINJA ISLAND. It's ready to run, and you'll note it doesn't require all that much reading. Let's go through the document page by page and make sure we understand it. First up is the cover, which hopefully provides enough explanation that you can use the adventure (even without reading this blog post). Every DINO-PIRATES adventure will have this info. You don't need to print this page. The second page is for the players. There's a quick description of the Concept -- the problem the heroes will have to solve, as well as a sketch map of the adventure locale. It's not a very detailed map, and there aren't any further detailed maps, since the whole idea in Old School Hack is that you draw the maps yourself at the table. This is just to give the players a bit of a mental model they can hang the encounters off. Then comes a page of tables: Adventuring Goals and Random Events. These are two of the lists that I use to create a DINO-PIRATES adventure. Print this page off and lay it out for the players to look at. If they want to choose an Adventuring Goal, that's great, but it's also okay if they don't. You'll use the Random Events table whenever you feel like shaking things up for the players. It's a great way to pull in a player who's been a little sidelined lately; just point at them and say, "Roll on 'The God Awakes'!" Suddenly they're at the center of attention. That's it for player material. The rest of the document is for the GM. Next there's a page that outlines the adventure -- this is the list of Locations. It's followed by three pages of Location Sheets detailing each one. Have the Location Sheets at the table and you can use them to keep track of the situation as the battle proceeds, and make sure you don't forget any important clues or bits of knowledge you meant to give the heroes. Finally there's a page of NPC sheets with more details on a couple of the key bad guys in this adventure. These characters might show up in more than one location, so you can have their details at hand without flipping through pages. And that's it! 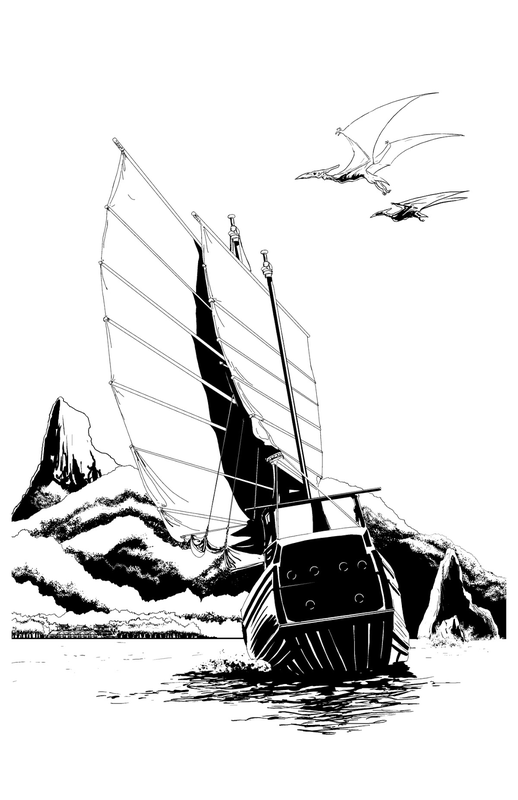 Eight pages of thrilling adventure, totally free! I hope this enables hours of fun for you and your friends. Let me know how it works for you in the comments! Prepping for a DINO-PIRATES OF NINJA ISLAND is actually really easy, but the key elements are not at all obvious. Here's my system for ensuring game sessions full of crazy adventure. Having run probably more than a hundred of these sorts of sessions, I have a pretty tight system now for developing them. It really isn't that much work, but it's very different than the sort of prep work I do for other games. Instead of describing a location in detail, or setting up an elaborate plot, this system starts from a high-level idea -- the Concept -- that's quite simple to come up with. Then I create three lists of loosely-related and not-very-detailed items, which work together at the table to produce a fun and satisfying adventure story. I always start with a Concept. It doesn't have to be very fancy. Once I have that, I build three lists: one of Locations, one of Goals and one of Randomness. Those three lists will form the basis of the adventure. How they get combined is up to the players and myself as we play the game. So the first thing is a simple, obvious Concept for an adventure -- like "Stop the evil sorcerer from enslaving the volcano god!" or "Destroy the SLAVE QUEEN'S mind-controlled army!" A good adventure concept describes an ACTION to be taken by the heroes. This action needs to be about opposing some evil scheme (like mind-controlled armies, or whatever). I can come up with this sort of evil scheme just by playing around in the setting, and generating "what if" sorts of questions to myself. "What if an Imperial Sorcerer decided to go undercover and take over a ninja clan?" Even the simplest idea can work. Once I have the evil scheme in mind, I think about how the heroes would get involved to stop it. I don't mean "They meet an old wizard in a tavern who tells them where to go". That's way too much detail, and who cares about all that crap? This is about choosing a VERB. Do they STOP the scheme, or DESTROY the hidden base, or RESCUE the prince? That's it. One word does the job. So that's my Concept -- an evil scheme undone by a verb. Now I've got three lists to create. The order in which they get created isn't important -- actually I always build them in bits and pieces, letting ideas for one inspire entries in the other. I learned this trick from Kirin, the designer of the original Old School Hack, and it always works great. It's surprisingly powerful to supply a random factor that might interrupt heroes bent on saving the day. For the volcano god adventure, obviously I decided geologic activity would be the thing, so the random list includes lava, earthquakes and so on. For an adventure in which a bunch of heroes have to get a little baby to a distant fortress, the baby itself became the random trouble-making element. I make a little table for a d12. 1 - 6 is always "no result," so that not every roll causes trouble, and then I come up with six other possible results for 7 - 12. 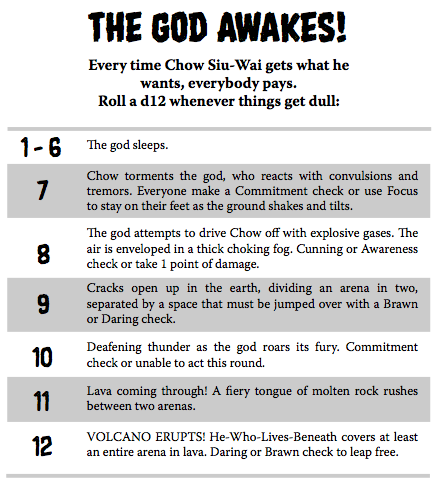 Here's an example I used for the volcano god adventure. So there's six possible results -- each with a different in-game consequence. I always make 12 the biggest, craziest one, just because, well, it's 12. 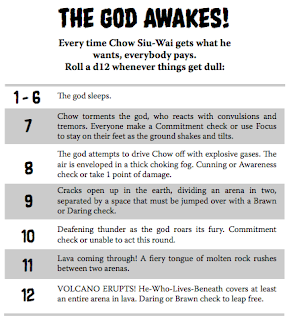 The players have the table in front of them and every so often I'll just say, "Okay, somebody roll on the volcano god table." Then there's a tense moment while they await the result, and then the game carries on. "Master Nobitsuna of the Dragon’s Eye Clan has disappeared, leaving only the word “Tuloanga” carved on his cell wall." Who is Master Nobitsuna? 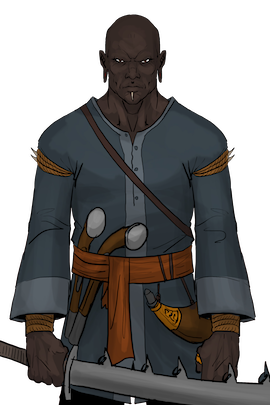 Who are the Dragon's Eye Clan? It doesn't really matter at this stage. These details might inspire entries in one of the other lists, or they might not get referenced anywhere else. If a player picks this goal, we'll figure out how it fits into the adventure together. It might seem like a strange thing to focus on, since in any given session, most of the supplied adventure goals won't even be used. But I've always found it a great way to generate ideas that can feed into the story, even if nobody picks the goals. Thinking about the adventure from the point of view of the heroes, and why they might get involved, is a powerful way to sort of trick yourself into creating a really hero-centered adventure. And that ends up being more fun for everyone! Meanwhile, I grab some location sheets and jot down whatever notes come to mind about scenes I might have. I try to think of fun locations for a fight, or crazy bad guys, or some clue that needs to be given to the players. I can play off ideas that came up on the other two lists, and as I flesh those out (or come up with all-new possibilities), I can develop all the different pieces together. And again, I can always go back to my simple Concept to renew my creativity. For an adventure meant to last a few hours, I usually find four to six scenes is about right. What I normally do is come up with four "required" scenes and then a couple more "extras" -- sidelines or flavorful moments that aren't essential to getting the heroes to the big bad guy. I know my first scene is always going to be a fight -- an immediate threat the players need to deal with in order to survive. But it must do two other things: it must lead the heroes into the adventure -- there must be some clue or threat that draws or pushes them along. The first scene cannot be self-contained. It must present a mystery ("Why are these flying lava monsters attacking us?") or force them into immediate action ("Well, the ship is sinking and there's an island over there."). Or both! I used to spend a lot of time setting up the adventure, providing the heroes with "hooks" to draw them in, but in DINO-PIRATES OF NINJA ISLAND, that's really pointless. I'll just start right in the middle of the action, and can just tell the players, "Well, you decided to check out Captain Red-Eyes' secret warehouse, and you got in okay, but now these pistol-packing lizard people are attacking you." Other details can (if anyone cares) get fleshed out in later scenes. And I know my final scene will be a big set-piece battle, preferably involving lava, dinosaurs and maybe some shotguns. My other two key scenes might be more sneaky-around scenes, or get-someone-to-tell-us-whats-going-on scenes, although often they're just more fight scenes. I use the location sheets not only because they allow me to note down all the necessary details on a scene, but their small size prevents me from putting down too many details. This is a LIST of locations I'm creating, not a guide book. Locations, Goals and Random -- three very different lists, each contributing something unique to the Concept upon which the story of the game will be built. Because they're so different, when I get stuck on one I can easily jump to another, and usually my brain lights up again. And because they each need players to bring them to life, I know the game session is going to be spontaneous and creative for everyone. One of the real joys of running games, for me, is seeing a story emerge from something that wasn't a story before. It's really magical, especially when it happens from something like this -- with just a basic concept and three lists of disconnected items. I have time and time again seen how a group's imagination will take off and make a story happen right in front of us all. I'll be publishing a sample adventure using just this format very soon -- stay tuned! In the meantime, please share your adventure prep ideas in the comments!